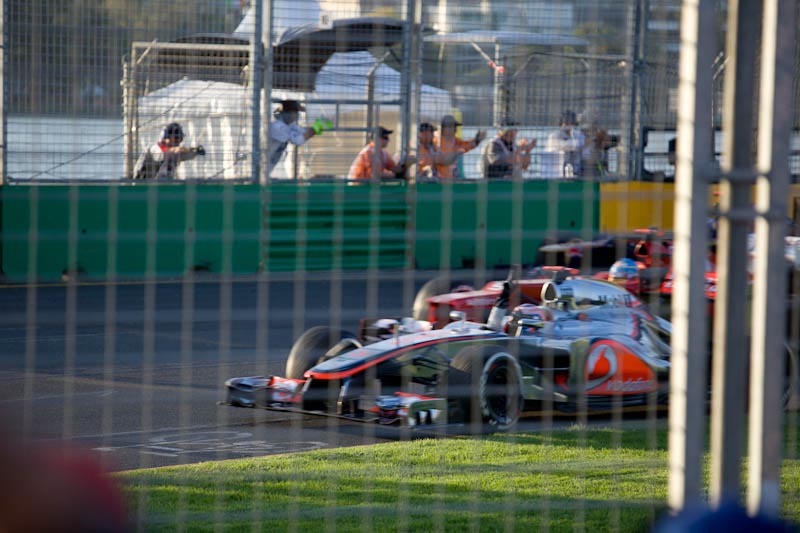 Thanks to the greatness of one of our Friends with Benefits (see stephs blog) we were able to get free entry into the Formula 1 Grand Prix in Melbourne; this is a great race to be at for many reasons including the fact that it is the first race of the season. I am a bit of a fan of F1 thanks in most part to my mother who in turn loved being at racetracks thanks to her father. It was a result we actually made it as we had discussed going but it was clearly out of budget and I was not winning the ‘luxury’ expenditure argument with Steph! This was not our first visit to grand prix, I had been to the British Grand prix and Steph on previous travels had made it to Monaco, although being American F1 is not typically a favourite sport so I had to get her up to speed with the racing, teams and drivers but basically all she needed to know was the Maclaren team and drivers Jenson Button and Lewis Hamilton, The Brits! Although during the few Days before the race Steph wanted to know about why there were no women, after some research she found out that there had been a couple in the past but none for a while. Whilst driving back from Melbourne a couple of days before she announced to Bert and I that she was thinking that F1 could be a new career for her as she loves driving and is pretty good! To this I was happy as these drivers make an absolute fortune, so watch this space……. The event is more of a festival of speed, offering all things car related. It has different races going on including Porsche series and Australian V8 racing. It also has displays of all manner of cars from Classic Bugatti’s to top of the Range Ferrari’s. 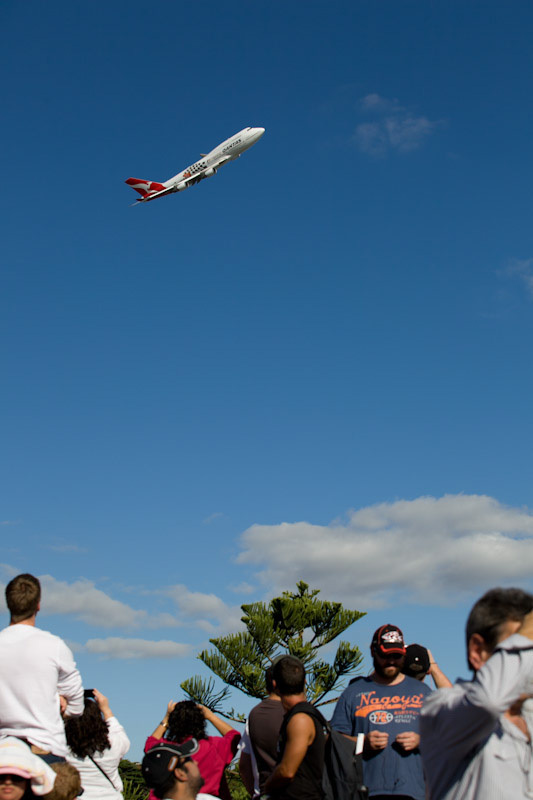 It also had fly over’s by Fighter Jets, The Blue Angels and a Qantas 747 doing it moves over the racetrack, pretty impressive! The Race itself was actually starting late at 5pm, due to TV rights and the relationship with Melbourne to the rest of the watching world’s time zones so we were able to find ourselves a little spot on a hill by turn 9 and 10. One thing Steph had asked before we left the house in the morning was, ‘should we take earplugs?’ I had either forgotten or had not been as close to the track at my last grand prix, as I said no we would be fine! Famous last words, as we looked around 95% of the crowd had proper ear muffs or ear plugs…ooopsie! In the distant we could here the engines start up and the cars take to the grid for the formation lap, we got the cars at a cruise this time, they were loud, but the buzz in the crowd was epic as the excitement built up for the start of the race! Back to the grid my drivers Messieurs Hamilton and Button (my favourite driver) were 1 and 2 respectively, the seasoned Australian Webber and current world champion Vettel were just behind! In fact there were 7 former world champions in the race; it had the ingredients for a great race! 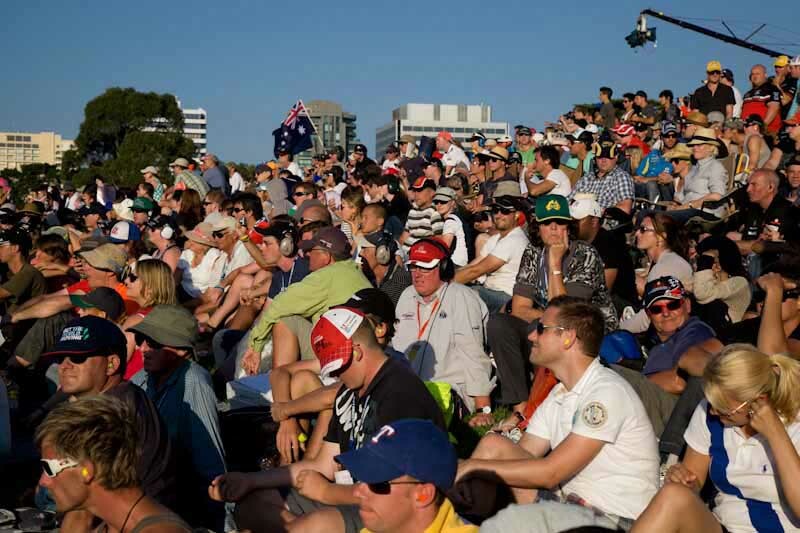 The crowd was glued to the screen as the countdown began, we counted down the lights……the most intense roar from the distance as all 22 engines fired up and shot off for the start of the race. We saw Button squeeze Hamilton at the first corner to take the lead. No more than 30 seconds later they were at our corners, the noise was of epic proportions, and not even Soundwave was louder than this! We glanced at each other and laughed….should have bought the earplugs! No matter what played out was a great race and a great start to the season, the atmosphere was amazing and the Brits did me proud First was Button and Hamilton followed him into Third!